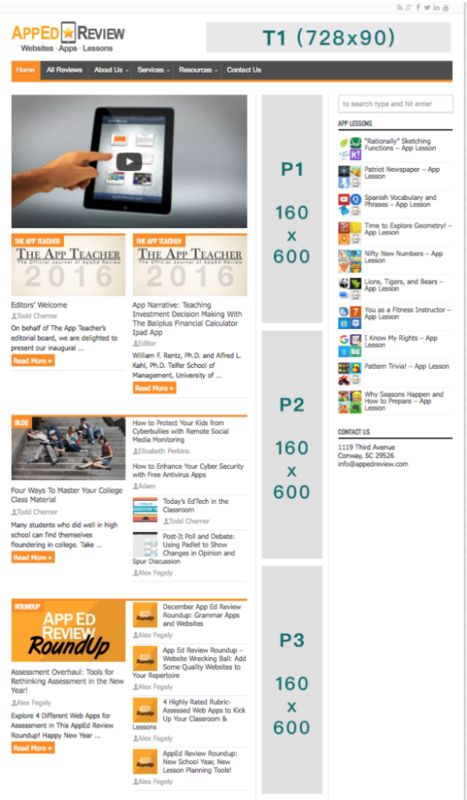 With thousands of monthly visitors, App Ed Review is dedicated to the dissemination of high-quality, research-based reviews of edtech products – apps, websites, and lessons – that can be used to support student learning in the classroom. Founded and managed by instructional technologists, advertisements posted to the website must be appropriate for the K-12 audience that includes teachers, administrators, researchers, coaches, and more! Content deemed inappropriate will not be posted and payments received will be refunded minus any fees incurred from third-party services (e.g., PayPal, Square, etc.). We are pleased to offer developers, non-profits, companies, schools, and other organizations with the opportunity to advertise on App Ed Review. The following schedule is based on an advertisement being posted to App Ed Review for one month. * If you are interested in placing an advertisement for longer than 30 days, please contact [email protected] for more information. Ad format and file size: Only JPG and GIF are accepted for any advertisement size. Also, the file size cannot exceed to 50K.